ColdCube© Under Counter Freezers (shown with optional Paper Chart Recorder, left) are ideal when space is at a premium, but quality can’t be sacrificed. This compact freezer is available in a single (0°C to -45°C) and dual stage (-50°C to -86°C) version. 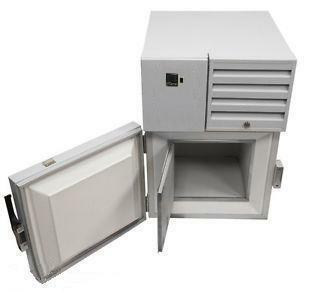 The ColdCube has 1 cubic foot of space, one inner door, for lab, benchtop or under-counter use. 18 gauge steel with high-impact powder coat finish and CFC-free, foamed-in-place insulation helps conserve energy. Perfect for use in clinical trials, laboratories or on the manufacturing floor. The front loading door allows use on top of a bench or lab table, or under a counter. The energy efficient construction and rugged industrial-quality materials will make this a long lasting and cost saving freezer for many years. Compressors: hermetically sealed and refrigerants are CFC-free. The door has an easy-opening magnetic latch with key lock. Note: IDS chest freezers are most often sold in the 115V cabinet, but it is also available in 220V (50 or 60 hz) Pricing may be higher, please request a quote, (shipped without a plug)however, if you specify the NEMA number for the plug, we can install it before shipping. NEMA Plug and Receptacle Chart. The amount of frost that accumulates will depend on the amount of times the freezer is opened and the temperature of the product you are storing in the inside as well as moisture in the air. A plastic spatula (or pancake flipper) and scrape the ice when it starts to build. (Nothing that is too harsh or has sharp points). If the outer door looks like it's not sealing, use a mild cleanser and clean the gasket on the door. The gasket is magnetic and if the gasket is dirty, it may not be able to make a connection to the cabinet. This can help cut down on frost build up too. These benchtop models are not UL listed at this time, but have passed UL field inspections. You will need to contact UL and ask them to inspect on site if you require a UL approval. Standard Controller: The standard controller on the Super cold chest freezers, left, has optional USB ports and PC software available to keep a digital log of temperatures. Ask for further information in your quote! *Access port for temperature probes is standard on this model. The foamed hole located on the back center measures as small as 5/8” and as large as 3/4” for 3rd party temperature monitoring systems. Larger access port sizes are available as options or in different locations. ﻿Turning the unit on and off frequently is not recommended. Doing this could cause the unit to get oil logged which clogs the refrigerant lines and causes the freezer to warm up and not make temperature. You do want to defrost the unit once or twice a year, but make sure you leave it powered down for 48 hours ( any weekend you have an empty freezer is usually a good time). Each unit is warranted for a full eighteen months and covered by our exclusive service network. 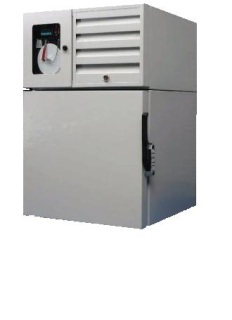 We also offer extended warranty on the compressor specifically. Ask us for a quote for your specific application. 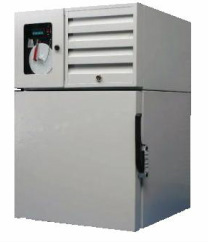 IDS freezers are also available in upright, general purpose and lab models with accessories. 4100017-1 - Access Port 1"
4100018-1 - Access Port 2"
View this units' Warranty here. Includes package of 50 sheets for the 7 day temperature logger. OPTIONAL PC SOFTWARE TEMP LOGGING NOT INCLUDED - Ask For Quote!